This is one of only a few 16th-century buildings created for indigenous ruling families still standing in Mexico. The structures show awareness of both European building technologies and long-standing pre-Hispanic conventions—including the flat roof and frieze of disks at the upper edge of the building. 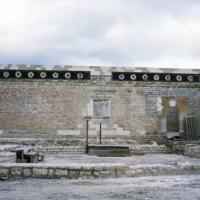 This photograph shows the buildings under restoration. The building was originally constructed of hand-shaped blocks of stone, which, in an indigenous town, would have signaled both the building’s expense and high status. It has an arched doorway, and prior to the arrival of Europeans in the Americas, the rounded arch was not used in indigenous architecture. The entablature features a frieze of disks, which has parallels in many high-status indigenous structures in southern Mexico, dating from both before and after the arrival of Spaniards. Friezes of this type appear on both domestic and religious administrative buildings. 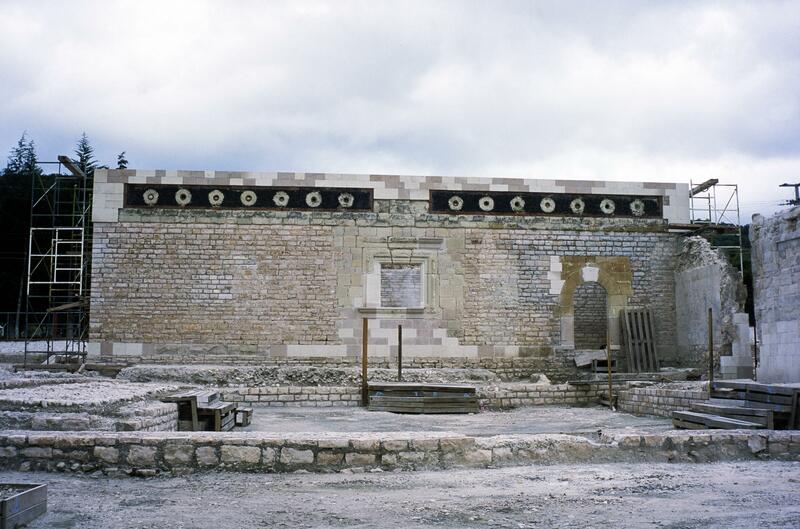 The present-day restoration of Casa de la Cacica, the reason for the scaffolding, includes the reconstruction of walls as well as the stabilization of existing structures. Local residents of Teposcolula built this complex. The patrons were most likely an elite Mixtec family, and may have included Catalina de Peralta, a leading member of the local ruling family of Teposcolula. The house is named Casa de la Cacica in reference to her, although the structure’s original name is not known. Stone, plaster and paint would have been the primary materials used. The town of Teposcolula, with its grid plan, is the product of a large-scale urban planning endeavor, conducted as colonial officials moved indigenous towns and reorganized them along Renaissance town planning models. But local practices also held sway. This indigenous complex was built by Mixtec residents as part of the town’s new urban plan, and set on axis with the great open chapel of Teposcolula’s church. This residential complex occupies a plot of land directly opposite, yet completely visible from the local Dominican religious complex. Scholars believe this locale represents an intentional choice on the part of the local Mixtec ruling family. This urban connection between church and rulers’ residence suggests how, in indigenous towns, neither new town planning nor the introduction of Christianity went unchecked by long-standing local practices. Well before the arrival of Europeans, for instance, religious observance and local leadership were closely wed in Mixtec communities. The visual and formal relationship between these two Teposcolula buildings confirms that local indigenous authority drew upon Christian and other forms of architecture to reinforce its prestige, even after the arrival of colonial authorities. Kirakofe, James. 1995. “Architectural Fusion and Indigenous Ideology in Early Colonial Teposcolula.” Anales del Instituto de Investigaciones Estéticas 66: 45-84. Terraciano, Kevin. 2002. Mixtecs of Colonial Oaxaca: Nudzahui History, Sixteenth through Eightekjenth Centuries. Stanford: Stanford University Press.